Karla Yungwirth Designs: Here Comes Peter Cottontail! I found a great site, Bee Crafty with a really cute free digital stamp! I've never used a digital stamp before, but it was so easy to save to my computer and then print out and color. I used markers and colored pencils - my Prisma pencils are awesome for blending :) Bee Crafty is having a challenge to use any digital image on an Easter project and link to their site by May 1. 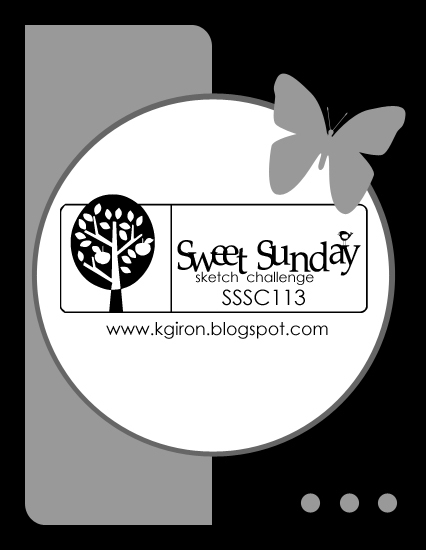 I used the Sweet Sunday Challenge for my layout, where you can always find awesome sketches! I added buttons on my card to go along with the Scrapbooker's Paradise Playing in Paradise 'Get Creative with Buttons' challenge. I used a die cut button with floss tied on and I attached the 3 little buttons at the bottom with Glossy Accents. I love this Topstitch paper from CTMH! I rounded the corners of my image instead of using a circle, and added some Stickles (of course!). Thanks for joining me, and for all the inspiration to create great Easter cards!! Very cute Easter card! I love the colours you chose and that image is very sweet. Very sweet! Love the image! Thanks for playing at Scrapbooker's Paradise! Great card Karla! Love the paper button! Thanks for playing along with us at Scrapbooker's Paradise!